The Australian steamer Wimmera was sunk by a mine laid north of Cape Maria van Diemen in 1917 by the German raider Wolf. Twenty-six of its 151 passengers and crew were killed. 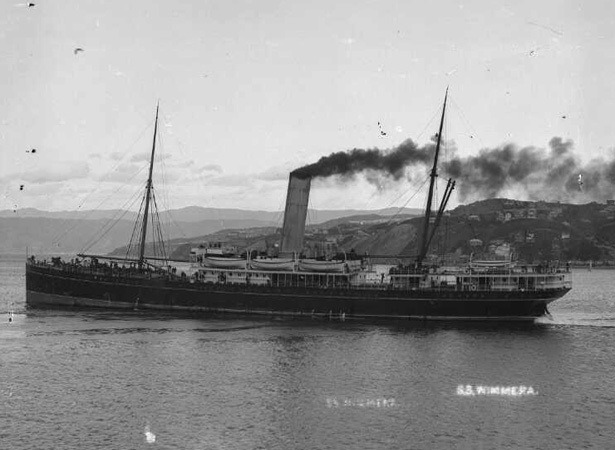 Huddart Parker Ltd’s Wimmera (3021 tons) had left Auckland for Sydney on the morning of 25 June, carrying 76 passengers and 75 crew. At 5.15 a.m. on the 26th the ship struck a moored mine, which exploded near its stern. Fortunately the sea was smooth and several lifeboats were launched before the vessel sank. Assistance was provided by nearby trawlers and the following day 125 survivors were landed in Tom Bowling Bay (near North Cape) and near Mangonui. The Wolf had sown mines north of New Zealand in mid-1917. Eleven had been discovered prior to the Wimmera’s sinking, but the British steamer Port Kembla had fallen victim to one in September 1917. The Court of Inquiry found that Captain Kell had ignored confidential Admiralty instructions to steer further to the north around Cape Maria van Diemen. The captain, in accordance with maritime tradition, had remained on board to the last and gone down with his ship. We have 19 biographies, 40 articles, related to Wimmera sunk by German mine.